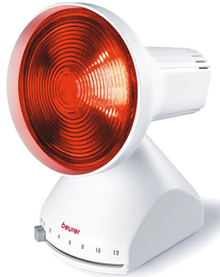 The Beurer IL30 Infrared Heat Lamp provides effective pain relief – drug-free! We are all susceptible to colds, flu and tiresome aches and pains; but sometimes medication doesn’t suffice and we need that little bit extra to initiate the healing process. When we’re feeling a little under the weather, it is more often than not - the little amount of infrared heat around us that causes us to feel unwell. The Beurer IL30 Infrared Lamp is the marvel of heat lamps; promoting healthy blood circulation to naturally speed up your recovery. How does the Beurer IL30 transfer effective, natural, drug-free pain relief? So, how do winter athletes or those who participate in winter sports such as skiing not freeze? That’s because skiers are wrapped in the sun’s rays which contain infrared; so even in the extremities of the cold, they are protected by the sun. Regardless of what the temperatures of the surroundings are, infrared heat can penetrate surface of your skin and release heat. We all know that stretching our muscles before and after a workout is essential because it promotes blood flow to the muscles; doing this before and after a strenuous run boosts the delivery of oxygen, aids in removing waste products and prevents injuries. 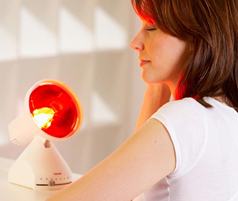 Using the Beurer IL30 infrared lamp on targeted areas, opens up your capillaries to improve blood circulation and enhances a natural process to eliminate any toxins that are in your body; this then encourages the damage tissue to heal. Penetrating deep heat to your muscles automatically relaxes them to reduce any stiff or tension and aids in your joints’ flexibility. The Beurer IL30 infrared heat lamp reduces pain and avoids inflammation to affected joints by producing a fast healing process. Your blood flow can increase by 400% in just half an hour of infrared heating treatment. Beurer are the celebrated health and wellbeing brand of the century, delivering products that are designed with phenomenal German technology; providing you with devices that are successful in creating all round healthier you. The IL30 Infrared lamp has a 150W bulb that distributes penetrative infrared heat to increase blood flow in areas that are sore. It is a tremendous, drug-free device to allow you to feel more relaxed in your own home. The four different adjustable angles let you adjust the devices, directing infrared heat to the injured area with ease. The IL30 infrared lamp is designed with supreme glass and a non-slip base, so it can radiate infrared heat safely. The lamp also has an automatic timer starting from 2 – 12 minutes increments, after the selected treatment period the lamp will automatically turn off. Ensure that the surface is even and there are no items that can easily melt are near the lamp such as plastic, carpets, table cloths etc. The timer will protect you from overheating yourself, but if you suffer from skin conditions such as psoriasis or eczema, have a chat with you GP about how long you should expose your skin to infrared light. When in use, simply distance yourself at least 80cm between the lamp and the targeted area; this too will protect you from any overheating. You can even use the infrared lamp on your face- just keep your eyes closed and do not look directly at light that is emitted from the Beurer IL30 Infrared Heat Lamp. It’s the perfect excuse to relax!